Dacorum & Tring AC’s Young Athletes Middle Distance group turned out in force on Saturday to post superb results in the third match of the Chiltern Cross Country League at Stopsley in Luton. 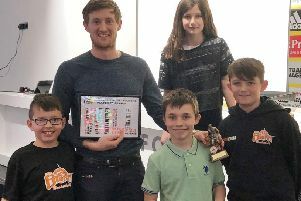 It came just days after their coach, Mike Dunphy, was named as runner-up in the 2016 Coach of the Year category at the prestigious Hertfordshire Sports Awards. Running in cold, dry conditions, Kristian Imroth produced the performance of the day to win the Under 15 boys race by a margin of 33 seconds. Freddie Truman-Williams (15:21) and George Dowding (15:58) both had excellent runs to finish 12th and 20th respectively, and were followed in by Fin Wightman (17:02, 35th), Luke Burford (17:21, 44th), Jack Hancock (18:28, 49th) and Dylan Alford (18:39, 66th). After three matches the Under 15 boys now occupy fifth position out of 14 teams in Division 1 of the league. The best team performance came from the Under 11 Boys team, led home by newcomer Jude Mckay (9:14) in fourth place. This was only Jude’s second race for the club – and his first run in spikes – yet he finished just one second behind the second-placed runner and only four seconds behind the winner. Equally outstanding runs came from Olly Painter (9:23) and Tim Fryer (9:29) in 10th and 12th positions respectively, ensuring that the team finished in second place on the day, and are now third out of 21 teams after three matches. Behind the scoring runners Niall Cassidy (10:07, 31st) and Sam Day (10:14, 33rd) had their usual close battle, with Niall coming out on top on this occasion. In the Under 17 Womens race Aoife Hanling (16:53, eighth) and Grace Birdseye (17:27, 13th), had their best runs of the season, backed up by Alex Bousfield (17:59, 24th), and the team now lies sixth overall out of 14 teams. Joshua Van Heiningen (21:22) was the club’s sole representative in the Under 17 Mens race, and ran a solid race to finish 17th. The Under 13 Boys race produced an upset, with Sam Burnell (11:53) first home for the club in 21stplace. Jamie Bailey (13:21, 25th), was well placed for much of the race, but weakened in the closing stages because of recent illness. He was closely followed by Thomas Durrant (13:23, 26th), in his first race for the club. Next to finish was Jack Raine (13:50, 36th). Thomas Ashton (14:09), returning after a recent injury, ran bravely to finish in 43rd place. The team now lie sixth overall out of 14 teams. In the Under 13 Girls race Jess Benveniste (11:53, 22nd ) produced her usual blistering finishing kick to lead home Izzy Painter (12:00, 25th), backed up by Stella Whitlum (12:45, 40th), yet another slowly returning to full fitness after recent illness. Once again this team now lies sixth overall out of 14 teams.Amy Lane (10:50) produced another fine run in the Under 11 Girls race, to finish 23rd out of 55 runners, and Amy Cassidy (15:59) also finished 23rd in the Under 15 Girls race, in which the club now lies eighth overall after 3 races. The junior runners contributed vital points to the overall club standings, with Dacorum & Tring AC moving up one spot to sixth overall in Division 1 after three races, ahead of such stalwarts as Aylesbury, Oxford and Harrow, and the top Dacorum club in the ranking by some distance. Missing from the Under 13 Girls team was top runner Olivia Edwards, who was running for Dr Challoner’s GS at the English Schools Cup Cross Country Final held at Formby in Lancashire. Running in the Junior Girls Race, Olivia finished 61st out of 140 girls in a time of 9:20, helping her school to finish in third place out of the 24 finalists.